Mahathir is now the oldest currently serving state leader in the world (aged 7004342570000000000♠93 years, 289 days). As proposed in the original plan of Pakatan Harapan, Wan Azizah ran as his deputy, and therefore became the first female Deputy Prime Minister in Malaysia. 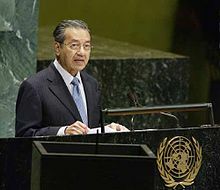 Following his appointment as Prime Minister, Mahathir promised to "restore the rule of law", and would make elaborate and transparent investigations on the 1Malaysia Development Berhad scandal possibly perpetrated by the ex-Prime Minister, as Mahathir told the press that if Najib has done something wrong, he would face the consequences.